Anyway, enough of my never ending saga of cuts and bruises. 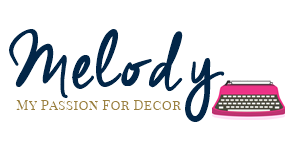 I have a fun makeover for you today! A few months back I went to a local garage sale. The woman who was having the sale was the sweetest! She'd been living in the same house for 50 years and they had recently sold the house, so it was time to purge. 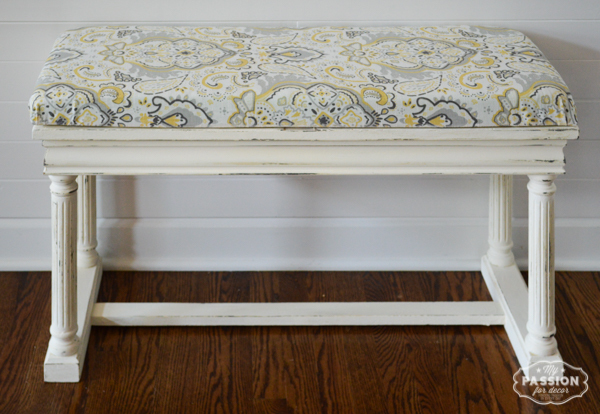 I bought a few small things, but the best score was this vintage piano bench. She tried to convince us to take the piano for free, but it was downstairs in their basement. Only catch was we had to haul it away. The hubby said, "No way am I moving this piano out of their basement!" That kinda put an end to that idea. Here's the little piano bench before. I knew what I wanted to do with the bench before I got it home, but first step was to give it a good paint job. 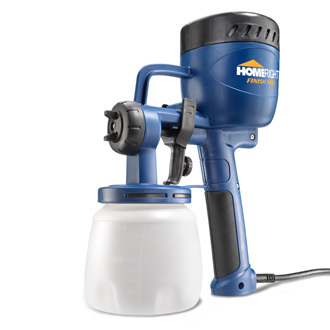 I was lucky because I recently was given a paint sprayer from HomeRight. I used this bad boy the HomeRight Finish Max Fine Finish HVLP Spayer. It's so easy to use! 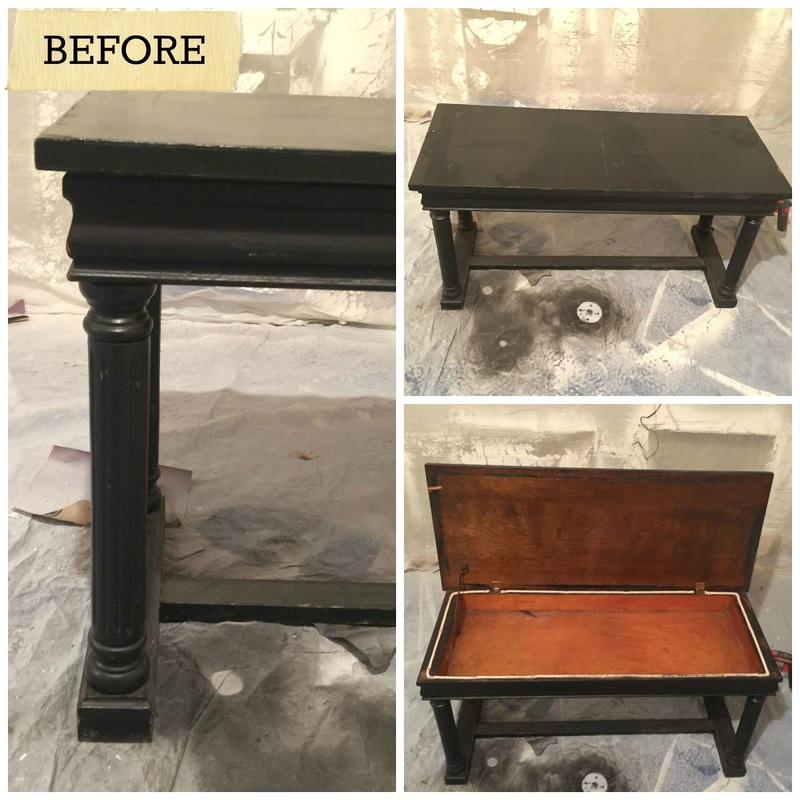 A few quick and easy steps and you're ready to transform any piece of furniture. I love using it for anything with spindles, like chairs or this piano bench. 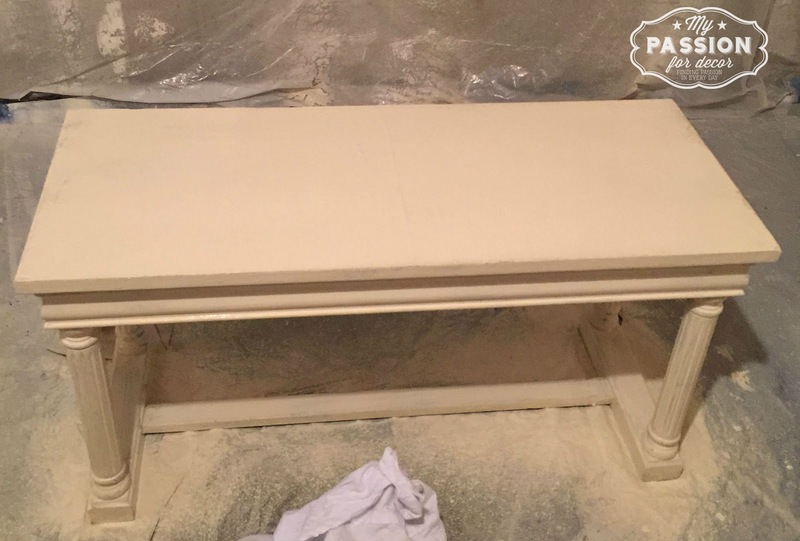 This is how the bench looked after two coats of paint using the HomeRight paint sprayer. Do you like the spray tent the hubby made for me in the basement? 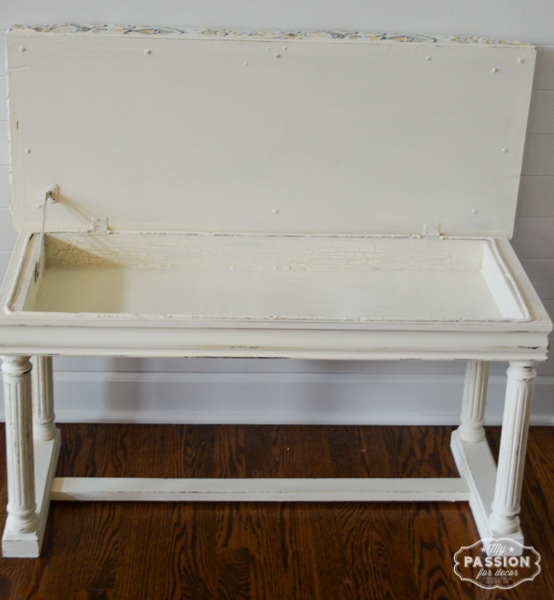 I used two shades of Chalk Paint™ decorative paint by Annie Sloan, Cream and Pure White. 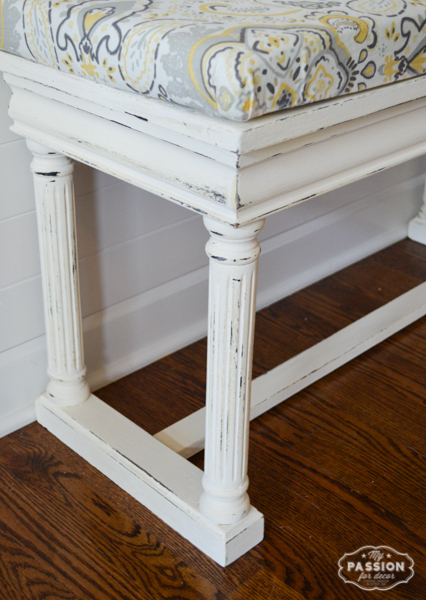 After the two coats of each shade of Chalk Paint™ were dry, I distressed the high points on the piece. Then I sealed the paint with clear wax. 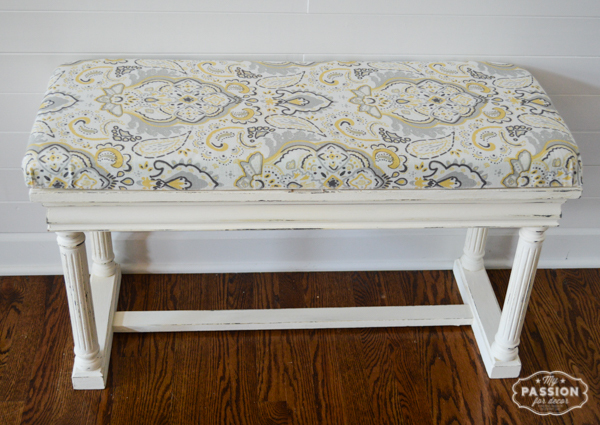 I knew as soon as I saw the bench I wanted to upholster the top. I quickly learned that there was no way to upholster the top directly on the seat. Luckily I had some wood leftover from another project that would work. I cut the wood to size on my table saw and it was ready for upholstery. I cut some foam batting to fit (OUCH!) and added some batting for a bit of cushion. Now all I needed was some fabric. Awhile back I bought a linen table cloth at Target on clearance. It was the perfect color combination for the bench. After the upholstery was done it was time to attach the top to the seat. 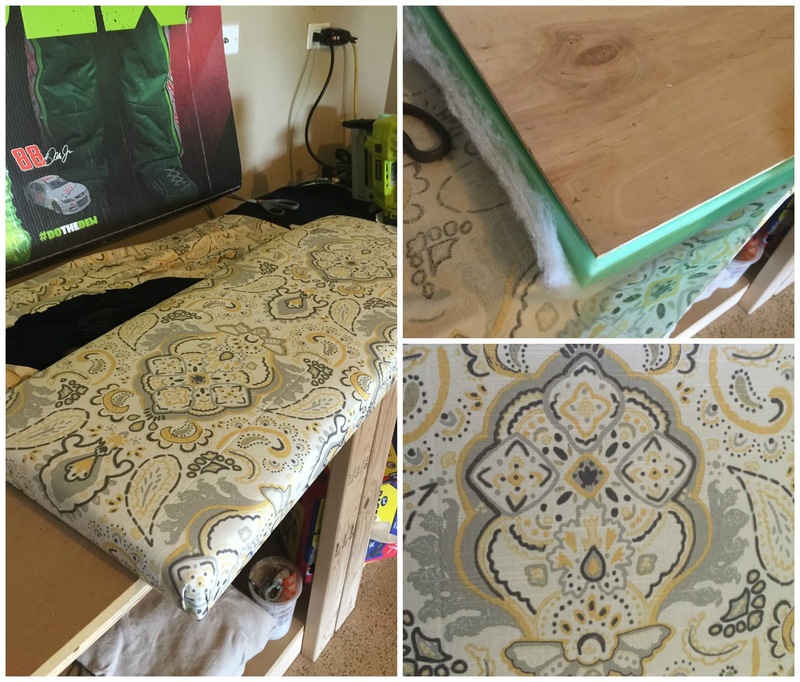 I secured the upholstered top to the seat with screws and I was finished! Here's how the bench looks now! 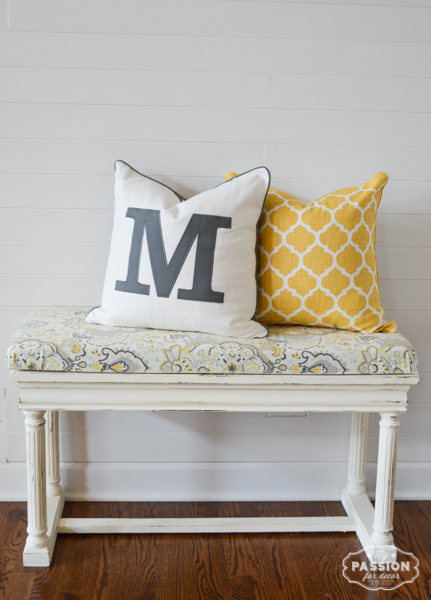 I think the fabric is perfect for this bench! I'm in LOVE with these legs! This is a great place to hide papers, magazines...you name it. 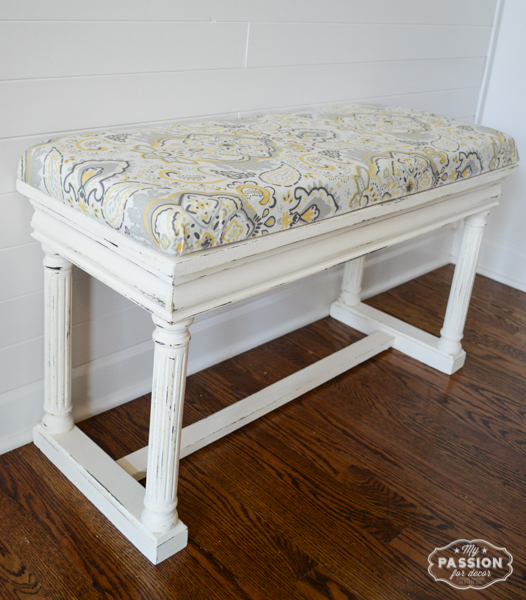 This little piano bench has a special place in my heart. There's just something about it that I have connected with...I know that sounds weird! Every piece of furniture I give a new life ends up being special to me. I guess it's a part of me because it's my vision of the piece come to life. 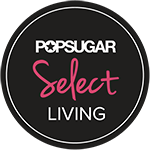 How about you, do you have any special pieces of furniture in your life? Or am I the only person who has crazy connections to furniture? Please tell me I'm not alone! 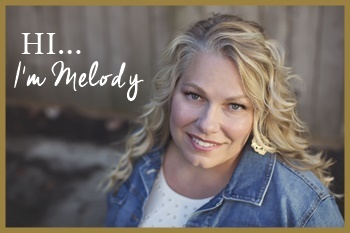 Love it, Melody! I also get connected to certain pieces of furniture. Perfection. Everything about it is perfect, the legs, the color and the fabric. You have done it again!! That turned out awesome! OH I love the fabric and how it goes so well with this piece. they were meant to be together! 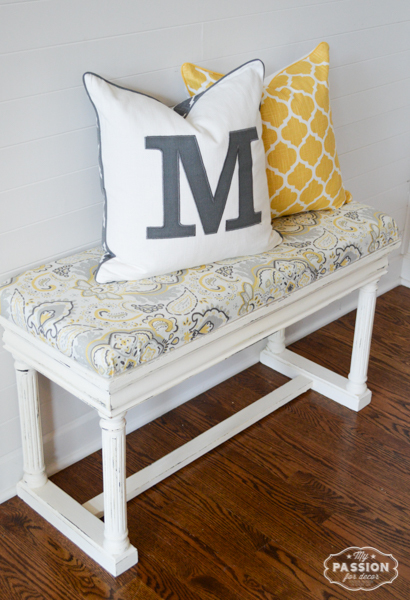 I love the piano bench. You have a wonderful talent to share. The M pillow is perfect too.